Traffic light fails to give a green to one's movement even after several cycles — what can a driver do? In some cases, when a traffic light has an inductive loop sensor, it is possible to approach a traffic light prepared to make a movement (through or turning), only to find yourself sitting at a red signal for your movement for several traffic light cycles. This can either be due to incompatibility between your vehicle and the inductive loop sensor in the pavement that tells the traffic light that somebody wants that movement (a common problem for bicyclists and motorcyclists), or due to an outright failure of the sensor loop or controller. Of course, notifying the local authorities (via a non-emergency means) of the issue is recommended, as they can't fix what they don't know is broken, but it may take hours or even days for a technician to show up to address a defective (not just incompatible) sensor or controller, and repairs could take longer yet, depending on the situation. So, in the meantime, what can/should a driver do about their predicament, keeping safety as the first priority? I ran into this in a car in the USA, by the way, but as mentioned, cycles (manual or motored) are known to have compatibility issues with inductive loops, so answers for two-wheeled vehicles and other countries are welcome as well. Whenever a driver approaches an intersection and faces a traffic control signal which is inoperative or which remains on steady red or steady yellow during several time cycles, the rules controlling entrance to a through street or highway from a stop street or highway, as provided under section 42-4-703 , shall apply until a police officer assumes control of traffic or until normal operation is resumed. Which basically means, come to a complete stop and yield to cross traffic, proceeding only when it is clear. So you may want to try to look up the law in your jurisdiction. As another alternative, in some places, and in particular in nearly all of the US, it is legal to make a right turn on a red light. So if you're in such a place, and there is no sign forbidding it, and there is a road to your right, you can simply turn right and then find a different route to your destination. Otherwise, if you have a phone, I would try to call the police. If traffic is backing up at the intersection, or you see other drivers doing unsafe maneuvers to get out, I would say it's justified to use the emergency number (112/911/999/etc). They could send an officer to manually direct traffic, or at least to shut off the signal so that it is equivalent to an all-way stop. That should be much faster than the hours or days that might be needed to make complete repairs. The first option, if safe to do so, is to roll or drive back a bit and pull up again. For a two wheeler going a diagonally can help at times. Sometimes waiting for a car to pull up behind you may help, as they might have what is needed to trigger the lights. But if this does not work, waiting till the lights are turned off at the end of the day seems the only 'legal' way in most areas. * See note at bottom of the answer. 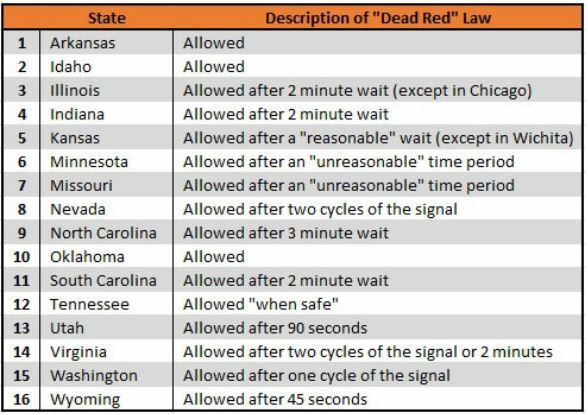 Mostly the traffic laws are rather local, state in the USA, country or province in Europe, sometimes even city in some areas. But most seem based on the same basic rule, do not drive through red. On the other hand, it is known to be a problem and the accepted solution in most areas is to wait a few cycles and then move forward with the next cycle's green on the lane besides you. Be very careful and only do it when it seems safe. Wait for a break in the traffic you need to cross or wait till the people in that stream of traffic recognize the problem and allow space for you to pass through. And do consider cameras which may be hidden to catch driving through red. Of course, you should inform the local authorities who are in charge, so they can repair or change the signalling in that crossing. As someone riding bicycles and tricycles I am too familiar with traffic lights not reacting. Note, not all traffic lights go into 'sleep mode' when not needed, many go on 24/7. Others 'sleep' only at night, switching to just warning lights or a system of yellow/amber for one road and blinking red (stop sign) for the other. Some sets of traffic light are programmed to become active when there is a given amount of traffic and go in active when there is no traffic for a given time. A solution frequently used here in British Columbia is to get out of the car and press the pedestrian crossing button, which forces the lights to switch faster than they would otherwise. Some drivers even carry a telescopic stick in their car to make it possible to press the button without leaving their vehicle. This is most commonly used where it otherwise takes a very long time to get a green, but it should work at an intersection where the car sensor is broken for some reason. The above solution obviously only works at intersections which have pedestrian crossings, so it wouldn't be of much use on rural highways. Traffic laws vary from place to place. IANAL but in that situation on a cycle I used to feel justified in handling it as per a defective light, with double-extra caution knowing that the cross-traffic sees a green and won't be assuming a four-way stop. On a bicycle though an easy, obvious, other solution is to get off the bike and walk, pushing the bike -- i.e. do what a pedestrian does to cross the road -- and then remount. Assuming the problem is an inductive loop, that may be another solution for a car driver -- i.e. pedestrians never trigger the loop, instead they may have a 'pedestrian crossing' button to push to trigger the light change for a pedestrian crossing. Perhaps you could exit your vehicle briefly (whether that's technically legal, IDK) to push that button. If it is safe and permitted¹ to do so, make a U-turn and take a different route to your destination. Inform the local authorities so they can urgently repair the light. In the USA and Canada, you may be able to turn right, then make a U-Turn (again where it is safe and legal to do so) thus approaching the intersection from a direction where the traffic lights hopefully are working. Unless you are sure there are specific laws that allow driving through a red light when the light is broken, and you are willing to risk fighting in court to prove that this was indeed the case should you be ticketed through an enforcement camera (or take your loss and pay the unfair fine), you don't really want to drive through a red light with a car. ¹Mark comments that a U-turn in the middle of the street is illegal in most jurisdictions in the US; I'm used to Europe where I'm not aware of such rules, but if true, that makes it much harder to do anything that is both legal and practical. A top mistake that causes dangerous maneuvers is when a driver absolutely refuses to change his route to adapt to conditions. “Oh my God, I must make this corner/ramp or I will DIE". No you won't. But you darn well could die or kill from that hare-brained maneuver you are about to attempt. So recognize, in that situation, that your "need" to make that particular movement is not written in stone. I'm afraid that "lets the air out” of my answer, not much more to say. Except It is legal to drive your car in reverse anywhere it can be done safely, except a freeway. That's my go-to maneuver in that situation: back the car up enough of a distance so I can change lanes un-awkwardly to a working lane from which I can craft a workable route. I used to do this very slick maneuver, I learned from a dear old friend, where I would make the first lane change while backing up, and the second lane change forward. But I no longer do that because half the time, when I start the backing maneuver, it steps on the sensor and immediately flips the light my way. Now I am ready for that. A cop watching you do this is going to err on the side of the safest course; the sure way to get a ticket is do a less safe thing when a more safe option is available to you. And the cop doesn't give a damn about what your intended route is, so "but I need that turn" will not persuade. In the USA, the easiest way to get a signal light to change is to flash your high beams multiple times, similar to a cop car with their siren lights on. All signal lights are designed to change for emergency vehicles. There have been a few times where my vehicle was not recognized being in the lane and thus I would simply flash my high and low beams multiple times until the signal light started to change. I probably wouldn't do this if there is a cop near by as I don't want to chance having the officer pull me over but it does work! Now mind you, this is for a working signal light. In the case where the signal light is not working (steady red or yellow or all signal lights flashing red or yellow) then follow the law in your area. Not the answer you're looking for? Browse other questions tagged usa driving road-signs or ask your own question. My B2 visa was stamped for six months even though I only stayed a few weeks. What if I want to return for a short visit after those six months end? Can you give your Swiss motorway vignette to a friend after using it on your car?